Pros: This is a full-throttle production by a contemporary theatre company oozing with confidence. Cons: The action is distractingly far-fetched, to the point of total implausibility, while the characters are never developed much beyond surface-level. It’s also about 45 minutes too long. A frantic and perplexing piece, where superfluous characters, action and dialogue obscure the issues being explored. 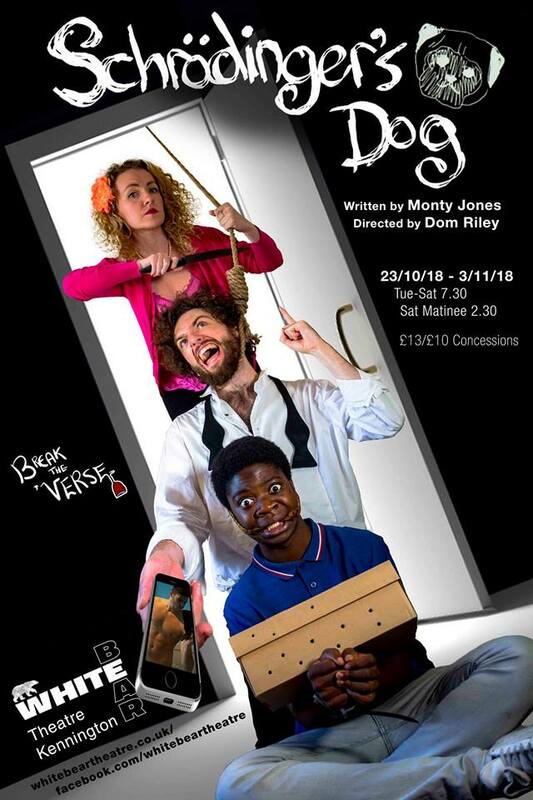 Shrödinger’s Dog, the second production from young theatre company Break the Verse, is presented as “a black comedy about the epidemic of male suicide with an LGBTQ+ twist”. It also features a cast of nine, and touches on quantum mechanics (its title is a play on a hypothetical experiment, devised by physicist Erwin Schrodinger back in 1935). If you think that sounds overly-ambitious you’d be right, and while you can’t fault the company for aiming high, the result is a chaotic production which never quite settles. At a time when there is more open dialogue surrounding mental health than ever before, and when conversely suicide remains the UK’s single biggest killer of men under the age of 45, now is certainly a good time for an unblinking and clever comedy about mental health to emerge. Unfortunately, Shrödinger’s Dog isn’t it. The plot is straightforward but cluttered: Hugo, an eccentric and suicidal young man, ‘accidentally’ kidnaps a pizza delivery boy and then takes six other people hostage. 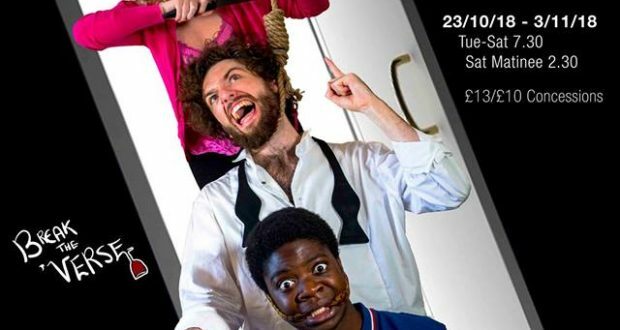 The seven detainees have several distracting subplots of their own to be getting on with, but are inexplicably unable to escape from Hugo, who’s perhaps the least threatening kidnapper you’ll ever see on a London stage. The central premise is ludicrous, but so is the majority of the play’s action. Suspension of disbelief can only go so far before everything becomes totally silly, and, as a result, any attempts to delve into the subject of mental health are simultaneously thwarted and trivialised. Of the play’s ten characters, nine dip in and out of the action without leaving any meaningful impression. Too often the writing falls back on stereotypes – the angry Scot, the no-nonsense Northerner (played the impressive Ella Hunter-Clark, whose natural comic timing provided the majority of the play’s genuinely funny moments), the promiscuous homosexual – which keep the characters distant. This lack of depth is exemplified by the central character, played by writer Monty Jones: despite his committed performance, the protagonist is far too erratic to serve as an effective prism through which to explore the play’s ostensive themes. The sizeable cast are manoeuvred around The White Bear’s well-dressed stage nicely, but the longer scenes become loud, messy, and reminiscent of an extended improv game. The pacing is jarring, and the play would definitely benefit from some major cuts – its two-hour length isn’t justifiable. I can’t fault the obvious effort that went into this production, nor Break the Verse’s laudable goals as a company. The show isn’t without potential, either, but it is in need of some heavy cuts and considerable re-working. There is no getting away from the fact that, at the moment, Shrödinger’s Dog is a bit of a dog’s dinner.